“What type of music do you listen to?” - was a very common question for me 15 years ago. The music you liked was crucial to define your tribe, your friends, and yourself, or at least it was for me and for us in our teenage lives. This week, Stefanie and I decided to deep dive into our music preferences, surveying our Spotify playlists and telling each other what we currently listen to in form of an infographic. I analyzed only the playlists I created, and not the ones that are shared with somebody else or the ones I follow; to communicate to Stefanie only the songs I actively decided to add. Every song in the postcard is represented by a black tiny elements, songs are grouped accordingly to my playlists and colored according to their genre. To define the genre, I looked for my songs on Spotify’s genres lists. …I deduce I am pretty coherent with my music, if you think that Spotify lists 944 genres! I also added attributes to each song indicating whether it has an “emotional meaning”, or it evokes a precise memory, and if I used to listen to it also before the year 2000. Yes. 2000. It is shocking to think about! When I was growing up, I used to make fun of my parents for listening to stuff that had been popular when they were teenagers, and I couldn’t really understand whythey practically liked only old songs, as if time would have stopped for them, music-wise. I was a teenager from 1992 to 2000, and I used to play in a heavy metal band (yes, I did), and you can imagine how music influenced a good bit of my life. I listened to my music all the times, hanging around with my friends who also dedicated unreasonable amount of time to discover new bands, to explore new music to be the cool one to find the most alternative artists. I believe music for us was also the first step that felt like independence: you would buy your first CDs with your allowance, and - if you lived in a small town like I used to - you would take the bus to a bigger city close by to get to a decent CD store; which actually was the highlight of our Saturday afternoons, at the time. The songs we would listen to are now a source of nice memories, they remind me of my adolescence, they still resonate with me in a way that newer ones I like are not able to. But I also have a good number of much more contemporary stuff in my lists, don’t worry. And I should thank Spotify for that: as for many other people, I guess, it’s my current source of discovery. With my boyfriend and my friends we don’t use to talk about the music we listen to, we don’t read about music anymore and we honestly don’t hang out to concerts of new bands that often. And also, I guess we’re all too busy to spend lots of time searching and finding new artists, even if somehow I miss the active discovery process. Now my relationship with music is incredibly different: music is a background for my days, rather than a core pastime. I now look for songs able to foster my concentrations when I am working or writing (mostly electronic music), or for melodies to chill down after work while having a drink with my boyfriend (mainly swing), or tunes to ease my falling asleep at evenings, like ambient music. 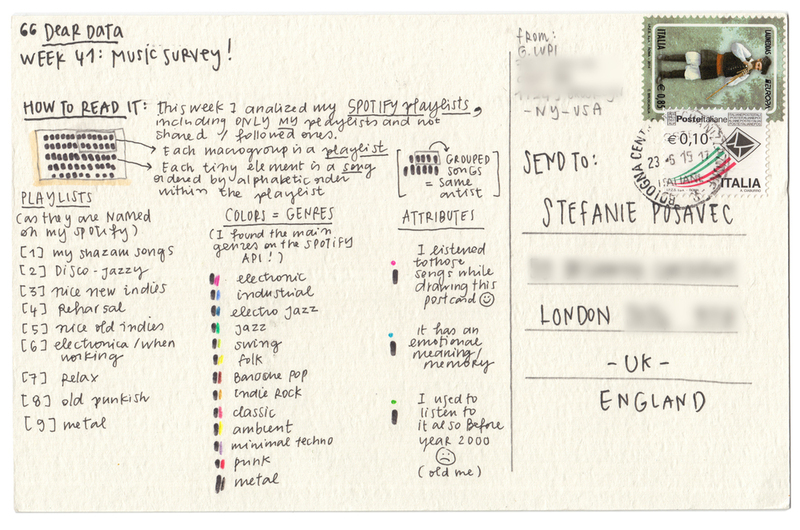 Well, no wonder Stefanie’s postcard made me smile: not only she addressed the old-songs matter too, she organized her drawing according to how old the tracks on her playlist are! She has definitely been smarter than me this week, I very much liked to browse through her categorizations: slow-low-chilled music, choppy-distorted tracks, party tracks!, and so on. After many flips back and forth, I put her card on my precious Dear Data postcards container, and I followed Stefanie on Spotify: for the first time in 41 weeks having access to the real information she symbolized with her card. We agreed to create a survey of our music this week, so I chose to focus on analysing music on playlists that I made over the past six months. I tried to categorise this music in a way that would tell Giorgia the most about my musical preferences, first organising my music by how old it was. I did this to highlight how I very rarely listen to older music, but prefer to listen to tracks that are only a year or two old… I don’t mind music that’s a little older but to me, listening to anything from the past feels as though I am falling behind and slipping away from the present: I have lots of ‘muso’ friends so I try to keep up with them by searching out new sounds. However, recently I started re-listening to a few tracks from FOUR years ago and I feel like a bit embarrassed when I do this, as though I am wallowing in nostalgia or something. I am always wary of living in the past, as new music has a vibrancy and a feeling of freshness that fades as a song becomes part of our cultural fabric, so I guess I’m always hunting for this excitement. Next, I also gathered data on whether or not the song had vocals, and if it did, whether it was an MC or not. My interest in music with MCs is mainly due to my history: when I was young I grew up listening to drum’n’bass from the UK, sitting in Denver (but dreaming of London) and listening to the MCs do their thing over these tracks. Then, when I finally moved to London, the music streaming out of houses or cars or pirate radio stations made me interested in grime, bashment, or any beat-driven dance music from London that is tinged with that particular dark and moody London sound. I moved to this city for the music and it hasn’t disappointed me, the producers and music-makers from my city make me proud to live here. Finally, I highlighted songs that were remixes, again to show Giorgia the type of music I listen to: I mainly listen to dance music, or beat-driven music that is in a state of flux, able to be chopped-up, remixed, and re-worked into new forms every week and merged and mashed with other tracks by a dj, where they become part of a bigger hour-long experience. I think when you are young you choose guitars or you choose beats, and I chose beats. I generally dislike guitar-driven music, and have barely any ‘guitar music’ in my collection. Ah, as a mid-30s married woman living a domestic life in a house on the edge of ‘proper’ London I think I would get an eyeroll from the youthful concertgoers if I ever went out to some of this music live but I’m content just to listen at home or through my headphones as I walk about the city. Hey, you on-point, cutting-edge, 18-year-olds, have another dance (or whatever you call it these days) for me. 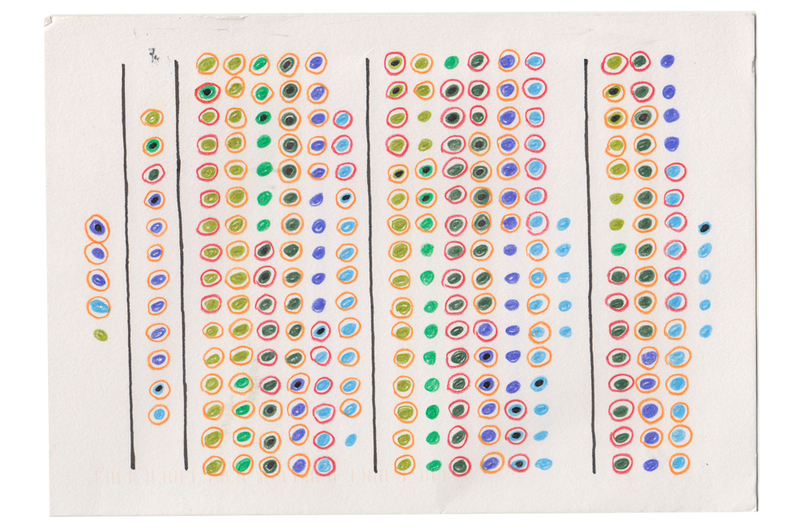 When I received Giorgia’s card I liked seeing how we approached the visual in a similar fashion: I like how these synchronicities happen without us realising it. And Giorgia listens to more music from her past, from her ‘old’ versions of herself, whereas I don’t, and this probably says something about the two of us. Like I mentioned before, I only focus on the present in music, because listening to older music reminds me of who I once was, and sometimes my past selves were embarrassing or cringeworthy. Music instantly transports you back to these past selves, so I think that Giorgia must be more accepting of her past than I am because she still keeps it as part of her life instead of trying to erase it as I do.